H. Rick Bamman - hbamman@shawmedia.com An Oakbrook Estates car port at 731 Hillcrest Ln. was ripped from the ground by high winds on Sunday, April 16, 2017. Trees were uprooted and roofs were thrown into the air though out the neighborhood. H. Rick Bamman - hbamman@shawmedia.com Oakbrook Estates resident Nancy Erckfritz walks back to her home Monday, April 17, 2017 after checking on damage from high winds on Sunday. 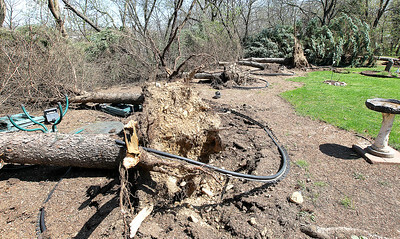 Trees were uprooted and roofs were thrown into the air. 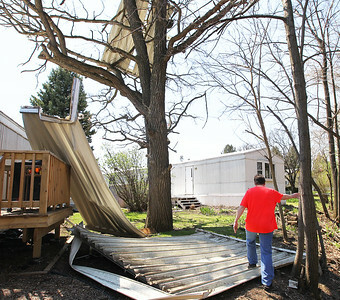 Erckfritz said a neighbor's deck chairs were lifted and tossed into the woods. Her shoes stayed on the deck. H. Rick Bamman - hbamman@shawmedia.com Trees were up rooted in the Oakbrook Estates neighborhood in Crystal Lake by high winds on Sunday, April 16, 2017. H. Rick Bamman - hbamman@shawmedia.com Brandon Spielman (left) with help from Chas Sedore work Monday, April 17, 2017 to remove damaged soffit from Spielman's mother's Oakbrook Estates home on Golfview Drive in Crystal Lake. 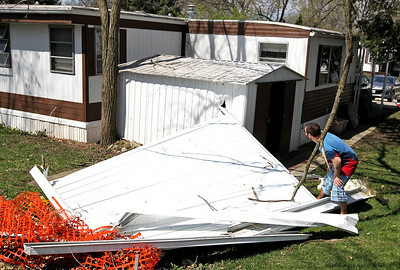 High winds hit the neighborhood early Sunday morning. H. Rick Bamman - hbamman@shawmedia.com Kevin Lingen examines debris Monday, April 16, 2017 from a neighbor's home that flew into his mother's Oakbrook Estates yard in Crystal Lake on Sunday. High winds tore off roofs and up rooted trees and left one home uninhabitable. 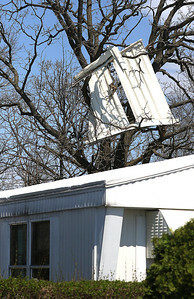 H. Rick Bamman - hbamman@shawmedia.com Part of a home came to rest in a tree on Terrace Dr in Oakbrook Estates after high winds hit the neighborhood on Sunday, April 16. 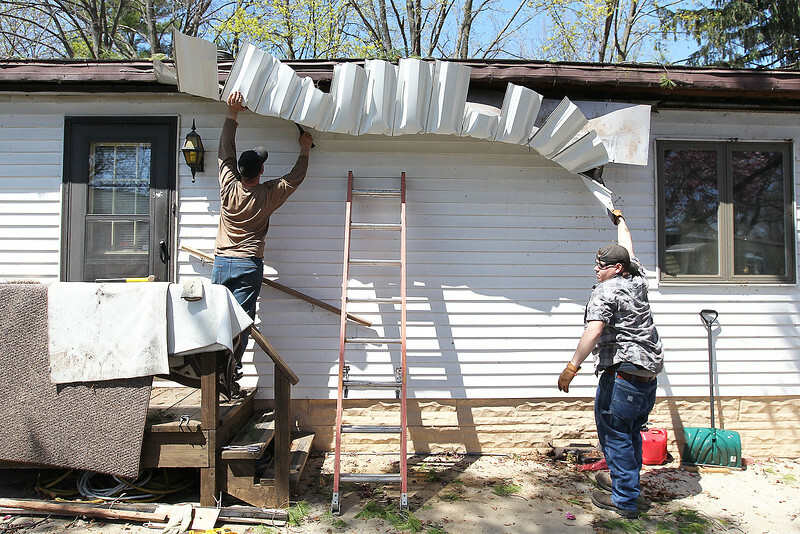 Brandon Spielman (left) with help from Chas Sedore work Monday, April 17, 2017 to remove damaged soffit from Spielman's mother's Oakbrook Estates home on Golfview Drive in Crystal Lake. 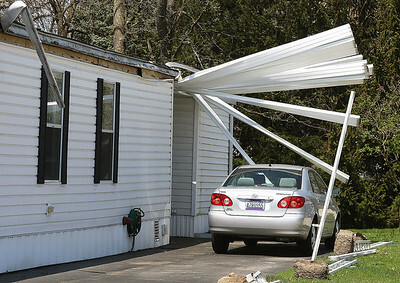 High winds hit the neighborhood early Sunday morning.